In Peter Rogerson's recent review of a cryptozoology title he noted that the Icelandic postal authorities had recently issued a set of stamps depicting some of the weird and wonderful creatures that haunt the seas around their island. Now their Nordic neighbours in the Faroe Islands, a self-governing Danish dependency in the Atlantic about 300 kilometers north-west of Scotland, have issued stamps depicting some of the creatures that haunt the islanders' dreams and legends. The publicity for the issue makes the very Magonian point that these monsters "deal with issues on the borders between the known universe and a threatening outer world which people feared" - the border between habitat and wilderness. In small island communities like the Faroes, wilderness is constantly threatening the fragile fabric of habitat, the sea is in many ways the ultimate wilderness. 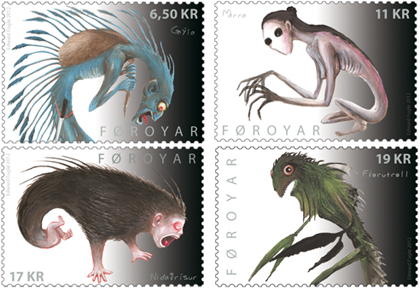 There are four creatures shown on the stamps, but it is not clear if the depictions of these are entirely artistic imagination or based on original folklore descriptions. The 6.50kr. stamp shows the Grýla - the bogeyman - which has developed from traditional Shrovetide carnival costumes, and serves as a warning to observe the Lenten fast: "This creature is otherwise known from folk beliefs to wander around ensuring that no children eat meat during the fast ... It carries a sack, into which it puts the children who have been so reckless as to breach the strict directive about fasting between Shrovetide and Easter..."
The 17.00kr. stamp shows the Niðagrísur - the 'child ghost' - which seems linked to ideas about abandoned and unbaptised children and changelings: "...there is thus the belief that children concealed at birth and murdered come back to haunt and show themselves to the living in one form or another. If we are to believe the Faroese belief, this ghost is small and chubby, bears a likeness to a child, and is no larger than a ball of yarn. The most common explanation for why they come back to haunt is that they want to have a name because they died without being christened." The 19.00kr. stamp shows the 'beach troll', the Fjørutrøll, which in the stamp illustration appears to be some sort of animated seaweed: "The troll is said to have been terrifying. Seaweed grew and pebbles hung all over its body. When it moved it sounded as if it was dragging millstones behind it and the ground came loose and spun around it. It was so large that it could be seen above the tallest houses". That description does sound, of course, like stormy seas and treacherous tides. The beach troll seems primarily to have evolved as a way of scaring children away from dangerous parts of the coast, which considering the Faroes are small rocky islands surrounded by an often stormy ocean, must be just about all of it. Perhaps of particular interest is the creature on the 11.00kr. stamps. this is the Marra - the 'mare'. In the Faroese version, this creature "appears at night and sits or lies on sleeping people, disturbing their sleep, causing evil dreams, and suppressing their breathing. It often appears in the guise of a beautiful woman – but is in fact an abominable monster. 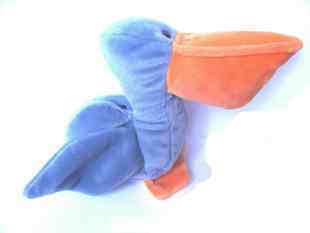 It wants to stick its fingers into the sleeper’s mouth in order to count the teeth. If it succeeds, the sleeping individual will die." Apart from the teeth counting detail, this is of course the universal figure of the 'Old Hag', the Night Mare, the succubus and incubus, the creature depicted in Fusilli's famous painting. Significantly the stamp artist has depicted this creature almost as a 'Grey', with featureless face, huge black eyes, long fingers and pall-like grey skin. The traditional and modern nightmares are merging. The stamps were issued on 30th April 2012, and you can read a fuller description of the legends associated with the creatures on the Faroe Islands Post Office website HERE, for the English version. Besides the Iceland stamps mentioned above, some Yeti stamps issued by Bhutan a number of years back, and the UFO stamps issued by a number of countries - usually just before a violent change of regime! - does anyone know of any other stamps for a Fortean philatelic collection? Yes, there are many cryptozoology stamps. I have a 1978 $2 stamp in a miniature sheet showing Sir Eric Gairy of Grenada. It is captioned 'Research into UFOs' and the sheet is issued because of the UN conference on the subject shortly before. Accompanying the sheet are 3 stamps on UFOs, one depicting Adamski's 'scout craft'. I believe Eric Gairy was deposed soon afterwards, in a coup. Robert Sheaffer once called this the curse of the Venusians. I think an African country (forget which) issued some UFO stamps a bit later, only to have its leader similarly ousted in a coup. This may be why, so far anyway, neither the US nor the UK have issued stamps with a UFO theme. I think the African country was Equatorial Guinea, whose odious dictator, Francisco Macías Nguema was deposed by his equally odious nephew. There is a series of illustrations of UFO/Fortean stamps on the Fortean times website here: http://www.forteantimes.com/features/articles/528/the_stamp_collectors_guide_to_the_galaxy.html although some of them seem to be from rather dodgy bits of the old USSR that are not generally recognised. They illustrate an article in FT by Luis R Gonzalez Manso on Fortean philately, which I have to confess I had totally forgotten about when I wrote this piece. So now we've got cryptozoology and ufology on stamps, are there any other Fortean/Magonian themes to stick on our letters. Any ghost stamps out there? Earth mysteries? I recall a series about ghost from a Pacific island, and Maldives devoted several miniature sheets to "Mysteries of the Universe" including crop circles, for example. The Nazca lines and the Pascuan statues have also feature in several Chilean stamps. My book Dinosaurs and Other Prehistoric Animals on Stamps (CFZ Press: Bideford, 2009) contains an appendix listing most of the cryptozoologically-relevant postage stamps issued up to 2009, including many former cryptids like the okapi, Komodo dragon, Congo peacock, and saola, as well as present-day cryptids such as lake and sea monsters, bigfoot, yeti, mer-folk, and the afore-mentioned Icelandic forms, plus one or two zooform entities like Black Dogs. Robert Sheaffer's book "Psychic Vibrations" (2011) gives the story of the Sierra Leone stamp featuring the famous 'Face on Mars', issued in 1990 as one of a set on space exploration. Because of this, Richard Hoagland, a staunch promoter of the 'Mars face' photo the stamp is based on, believed the set to be a great investment and could soon be worth as much as $10,000. A year later the set was catalogued at about $30.